Bob has had a long career in the arts encompassing a wide range of experiences. As an actor he has appeared on Broadway in The Drowsy Chaperone, as Bert Barry in the revival of 42nd Street, singing and tap dancing with his brother, Jim Walton and Karen Ziembe in The Ziegfeld Follies of 1936, Once Upon A Mattress with Sarah Jessica Parker, Show Boat (with his wife, Laurie Walton and 71 other actors), and as Jimmy Powers in City Of Angels, [also the LA and touring companies of that show.] In one calendar year, Bob was directed by Ginger Rogers in Babes in Arms, and toured with Mickey Rooney in A Funny Thing Happened On The Way To The Forum. Off Broadway, Bob was seen in I Love You, You’re Perfect, Now Change, Forbidden Broadway Strikes Back, and his first New York show, Preppies. Other favorite theatre productions include Bobby in Crazy For You, Psuedolus in A Funny Thing…Forum, Wilbur in Hairspray and Caldwell B. Cladwell in Urinetown! TV appearances include; Law And Order: SVU, Hope And Faith, Newhart, Picket Fences, Pros and Cons and Eisenhower and Lutz. Throughout the years, Bob continued to utilize his musical skills – as a pianist, arranger, orchestrator, musical director and writer. He musical directed and created orchestral tracks for many of the RRS shows in the early years. As a writer, Bob has collaborated a great deal with his brother, Jim, beginning with My Brother’s Keeper (1997 Bistro Award, Best New Musical), Double Trouble! (A Musical Tour de Farce), both of these shows featured Jim and Bob performing as well. Their very successful musical revue, Mid-life! (The Crisis Musical) ran for a year and a half at Chanhassen Dinner Theatre in Minnesota, and has been performed extensively through out the United States, Canada and Australia. Both Mid-Life and Double Trouble are licensed through The Rodgers and Hammerstein Organization. They are currently working on A Day In Gloucester, and Mid-Life 2! (Crisis Management). 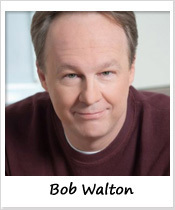 Bob is co-author of the Off-Broadway play Game Show, and has directed it in Atlantic City and Toronto. Bob’s show A High School Musical – 1973 had it’s world premier at the Riverdale Y with the Rising Stars in 2009. Married to Laurie Walton, they have two actor children, Emily and Alex.